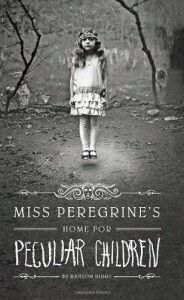 Miss Peregrine's Home for Peculiar Children - Ransom Riggs - review - So Many Books...So Little Time! A very unique combination of old photographs and an interesting story about the death of an old man and a secluded home for "peculiar children". Jake's grandfather Abe is killed mysteriously and Jake is the only witness to the "monster" that killed him. Abe's last words to Jake are about the home he lived in as a child and the woman who took care of the "peculiar children", Miss Peregrine. Abe urges Jake to "find The Bird" and warn her. After this traumatic event, Jake suffers a minor breakdown and begins seeing a therapist who suggests Jake look into his grandfather's past to come to terms with the present. Jake's grandfather had told him some fantastic stories about the children's home he grew up in after he was shipped out of Poland by his Jewish parents just before WWII. Abe described the kids he lived with to Jake and even showed him some amazing photographs, like the boy holding a giant boulder over his head with one hand, or the girl who appeared to be floating above the ground. As a young boy, Jake was fascinated but as he grew older he began to doubt all the stories and finally told his grandfather that he didn't believe them any more. However, there was something compelling about Abe's last words, and with the suggestion of his therapist, Jake's father takes him on a trip to the island where Abe lived with Miss Peregrine. Upon arriving, they find that the house is now a ruin and no one on the island knows anything about the people that used to live there. But Jake knows that somehow the Peculiars are still around, hiding, and very likely in danger from whatever it was that killed his grandfather.